Both modern and traditional garage doors rely on the spring system for seamless operation. It plays an important role in adjusting the level of the door while it is being closed and opened. Persistent weight of the door loosening of springs and can all of a sudden hamper the functionality without any forewarning. Our experts are right up to the challenge while dealing with spring related issues due to the long experience in resolving similar problems across various commercial and residential domains. A broken spring is a recipe for disaster if not replaced immediately. Even improper installation by the technician can result in ill fitted spring that is prone to further damages or worse it may end up snapping off being unable to sustain the weight of the door. In both scenarios, damage to life and property is imminent, therefore what you can do is to call Garage Door Mobile Service and get professional support. Majority of garage doors incorporate torsion springs in their framework as they are more reliable and robust than the extension version. Torsion springs easily support the opening and closing of the door due to its unparalleled tensile strength. Moreover, the cable components over which the spring is wound are so strong that they do not allow the system to fail even if the spring breaks down. The above mentioned factors make the torsion springs indispensable for any garage door be it a simplistic residential one or the multi-spring commercial version. 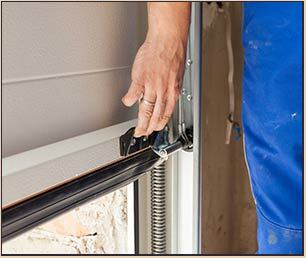 If you want a proper installation, call our experts because only they can only provide suggestions regarding the exact number of springs that have to be installed with the door and set it up properly. Conventional garage doors still use extension springs for day to day operation. The mechanism is quite simple as the system relies on the expansion of the spring when the door is closed and contracts if it is opened. Persistent tension on the spring during operation could lead to sudden breakage. Sometimes expansion beyond the certain limit may cause untoward damage not only to life but property. Although, extension spring based system is cost-effective, it requires regular maintenance. If you are facing any issues with your garage door springs or need an inspection, call Garage Door Mobile Service to get all-round support.